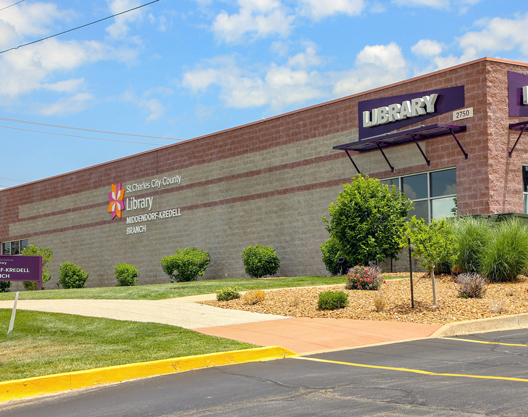 Located right on busy Highway K, the Middendorf-Kredell Branch is home to two special collections -- Consumer Health and Government Documents—that are supported by professional staff to assist you with your questions. The branch which opened in its current location in 1995 is approximately 30,000 Sq feet and houses a large collection of nearly 190,000 items. Middendorf-Kredell is named after Esther Kredell who left more than $800,000 to the Library District in gratitude for the library service she received as a child. Come inside and enjoy the spacious Children's Area, surf the web on library computers or use WiFi with your laptop. The Middendorf-Kredell Branch is an oasis where you can find just the right book, spoken CD, DVD and other items. We check out over 1 million items a year, and our friendly staff makes each and every customer feel welcome. Check out all the programs offered each month for children, teens and adults. We look forward to seeing you! The Middendorf-Kredell Branch is pleased to offer the AWE Early Literacy Station, a self contained, educational computer station with carefully selected programs for children aged 2-10. Located in the Children's Department, this touch screen computer contains over 50 top rated fun, educational games. The main library offers the literacy station bilingual edition, with programs available in English and Spanish. Click here for more information about the AWE Early Literacy Station, or come into the library with your child to check it out yourself!